Ribbons & Sweet Memories (RSM) is a family run business with simple goals and values: exceptional personal service, dazzling products and a deep appreciation for our customers. 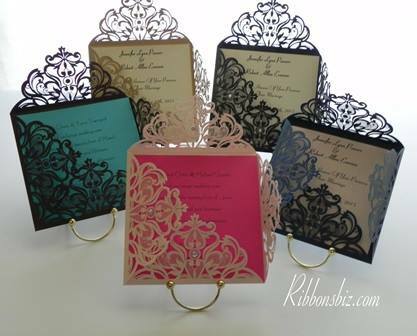 We handle five major categories of products and services: Event planning, Favors, All Occasion (greeting) Cards, Regular & Laser Invitations, and Wedding Products. We are currently licensed in licensed in Newport News, VA. However, we have done products and services for all customers within the United States; especially in the eastern section of the country. RSM is also pleased to announce that it has obtaibed SWaM Certification from the Commonwealth of Virginia. The Small, Women-owned, and Minority-owned Business (SWaM) certification program is a state-run program of the Commonwealth of Virginia. Their purpose is to enhance procurement opportunities for SWaM businesses participating in state-funded projects. We're happy to be a part of that program. RSM was also qualified as a small & minority business by the Virginia Department of Minority Business Enterprise (DMBE) which states: “Small business” means a business that is at least 51% independently owned and controlled by one or more individuals who are U.S. citizens or legal resident aliens, and together with affiliates, has 250 or fewer employees, or average annual gross receipts of $10 million or less averaged over the previous three years. “Minority” means that our firm is at least 51% owned and controlled by a member or members of a designated ethnic group. Please follow us on Facebook and Pinterest under the name: Ribbons & Sweet Memories plus on Instagram under the name: ribbonsbiz. we look forward to making your event remarkable!